Hands of Love Orphanage & School, Uganda is home for over 800 children age 3 to 19 years. It was started in 2005 by Pastor Elijah Sebuchu and his wife Ruth when they and their own children had little to eat themselves. With money that came to them from a legacy they were able to buy five acres of land in the Mayuge district to start the Hands of Love Orphanage and School in Namahdi (100 miles outside of Kampala). The Mayuge district is very poor: even the poor of Uganda say it is poor. In the beginning, the children and teachers lived in mud and stick buildings that Elijah and Ruth themselves helped to build. The orphanage started with nothing...no running water, electricity or toilets and little food. The children slept on dirt floors with scarce bedding, few had clothing. They were often hungry - some suffered from malnutrition. There were outbreaks of Malaria, and some of the children suffered from painful boils caused by Jiggers (parasitic worms that burrow under the skin). The number of children wandering from nowhere to nowhere in Uganda has just risen from 2.7M to 3.2M. John and Linda Gray, became UK co-ordinators of Hands of Love UK in 2005 after connecting with Pastor Elijah online. With Helen and Joan Moon they built a wonderful team of fund-raisers in their area and conditions for the children of Namadhi started to improve. Pastor Elijah spent time with HOL supporters in Stockton-on-Tees in 2007, visiting schools and churches in the area and friends in Scotland as well. In 2010 administration of the Charity moved to the Portsmouth area. Over 250 of our 848 children are now sponsored, and some staff are also sponsored. Children who are sponsored eat daily and have the assurance that someone cares about them. Through the generosity of a couple in America, who gave a lump sum to provide a Borehole for Namadhi in November 2012, clean water is now flowing abundantly for the children and staff at the Orphanage. How thankful and excited they are. Primary children enjoying running water. This young woman has just successfully graduated from a Business Course. She has been wonderfully befriended and emotionally supported through her teen years by her sponsor. Although known as the "Pearl of Africa", Uganda is one of the poorest counties in the world. Ugandans live with a legacy of genocide and abuse, perpetrated by its own native leaders as well as colonial powers. Just as the nation was recovering from the violent horror of Idi Amin's blood-soaked regime (1971-1979) that ended in a period of guerrilla warfare, the HIV/AIDS pandemic struck a whole generation of adults in the early 1980s. Today there are an estimated 3.2M orphans living in poverty and want. In the region of the Namadhi Orphanage 89% of the population is illiterate. Only 8% of Ugandans have access to electricity: those living in Kampala, Jinja or Iganga, all the rest of the population use paraffin lamps if they can afford them and cook over wood fires outside. 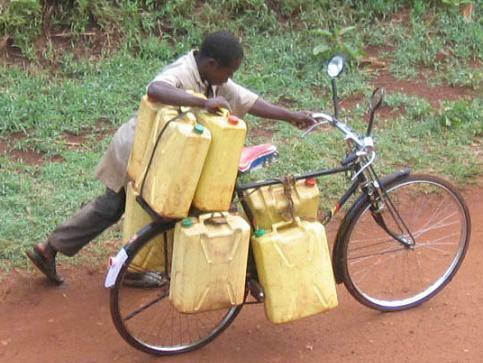 Very few have running water, most have to walk to fetch water in plastic Jerry cans. Although the suffering of these children is thousands of miles away, we are making a difference. Our prayers, encouragement and love brings hope for a better future.